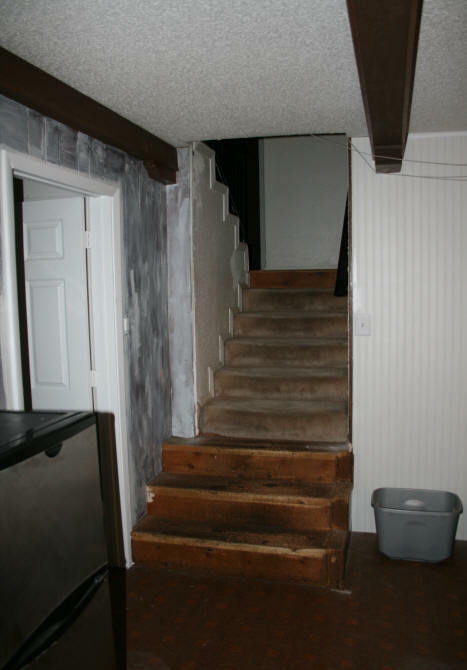 If you read the pages on the horrible man cave, you have already seen one picture of the stairs leading down to the lower level. They were carpeted with the beige carpeting we used in the main and upper levels of the home. 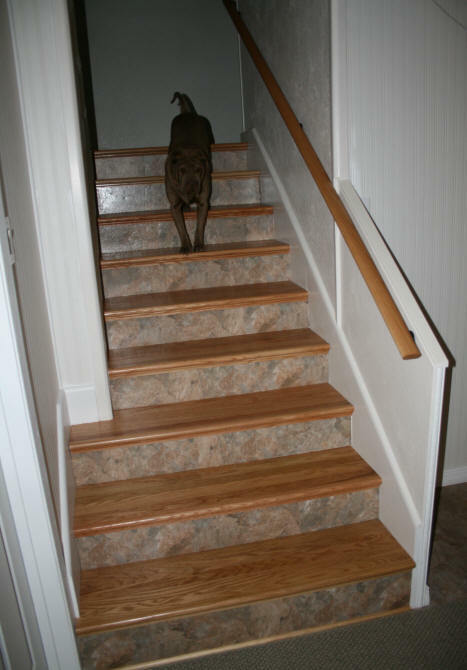 Over the years, the dogs pulled off the carpeting on the bottom three stairs and chewed on the wood underneath. We did not put carpeting back on, even though we had the scraps to do it, because they would have just eaten it up again. For years the ugly wood stairs remained. I had also peeled some of the paint off the walls because it was that thick from the previous owners. I planned to paint the walls after peeling the paint. This also stayed "as is" for years. The other thing I did not like about these stairs was the 2" moulding along the stairs. It was a pain to dust all along the little edges. With the dust storms in El Paso and the dogs going up and down the stairs, they were dirty all the time. The wrought iron banister that had been on the right side of the stairs was removed so I could place the wallpaper on the wall. I tried to put it back on with the 4" screws that mounted it but could not. I hated the bloody thing anyways. It included a gate that went across the third stair. When you used these stairs, there was nothing to really hold onto with the gate in the way. I had already had a few step mishaps which are just wonderful for a arthritic back. 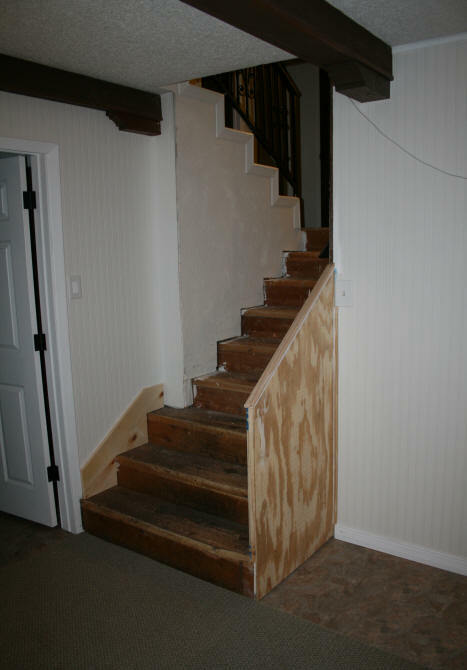 Again when looking for options to fixing these stairs, I was presented on the web with a multitude of solutions. Some expensive, some, not so much. Re-carpeting was not an option because I wanted a hard surface to step on. I also wanted the stairs to be easy to clean. The dogs constantly track grass and dirt up the stairs. 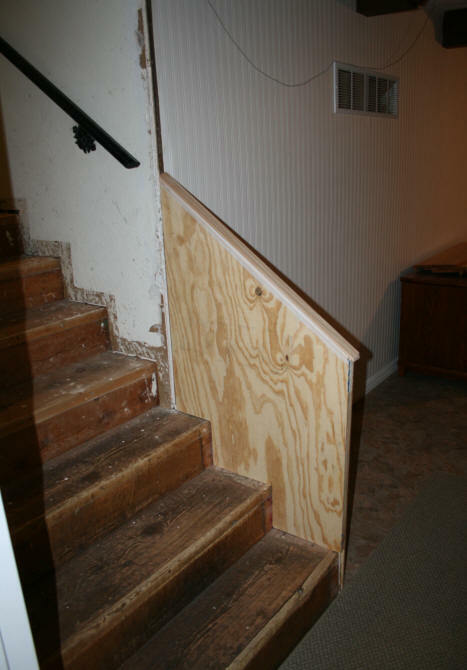 Replacing the wood with hardwood was an option but this could be costly and I did not relish the thought of a complete demolition of the stairs. 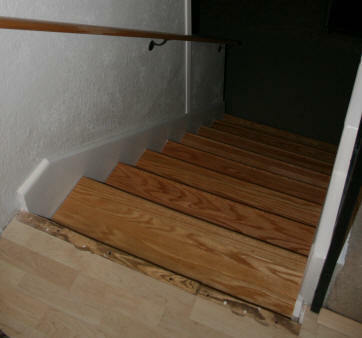 When I removed the old carpeting, I discovered that the wood on the stairs was ugly, but it was sound. So I went to work removing the carpeting tack strips and all of the nails. The option I chose was pre-made stair treads. The big box hardware store did carry some stair treads but they never carried the sizes I needed or enough stock, so I went online to purchase them. The company I ordered from was StairPartPros.com. They carried the same treads Lowe's did but they had the five 36" and three 48" treads I needed. They offered a variety of wood choices but I stuck with the more popular unfinished red oak. I just ordered the plain treads with only the bullnose moulding. I did not need any moulding on the sides because all of the treads would be encased. For the risers, I decided to make my own. The above photo shows the dry fitting of the 48" treads on two of the stairs. I was also experimenting with the risers. To create the risers, I purchased some 1/4" plywood and another box of the same vinyl tiles that I had used on the floors. I cut the plywood to fit each riser individually and cut and stuck the tiles on the wood. At this point in my projects I stopped to consider a wood cutting tool. The moulding I had cut for the man cave was all cut by hand with a hand saw, including the mitered cuts around the window without any kind of miter guide, believe it or not. I did have an old Black & Decker jigsaw I bought back in the 70's that still works but my hands no longer work that well. I needed something stable that could handle big jobs. Something tough...a R-E-A-L man tool. No girlie stuff for me anymore. So I bought a table saw. 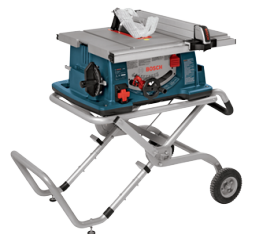 I bought the Bosch 4100-09 10" Worksite Table Saw with Gravity-Rise™ Wheeled Stand at Lowe's. The table extends a little for the wider jobs. The stand lets me move it around the garage and rolls out of the way when I am cleaning. It does have a hole you can slip a hose on for a shop-vac, which eliminates some of the dust. I was a little scared to use it at first after I put it all together. I was afraid of loosing a limb. I tried it out on some old doors I needed to get rid of. When I got the hang of it, I was ready to continue my stair project. Yea, boy-eee a real toy! And I love it! Before I could place the treads on the stairs, I needed to build something to place a stair rail on for the last three stairs. 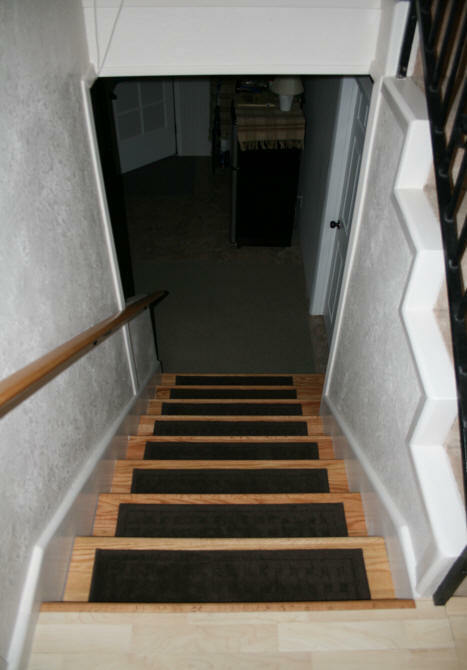 I wanted to be able to go A-L-L the way down the stairs holding one rail. I built a continuation of the wall with plywood and placed a scrap piece of moulding along the top of it. The wood was mounted to the wall and to the actual stairs. The stair rail and skirt would help secure the wood even more. I also started working on the stair skirts since I wanted to replace the old 2" moulding. The stair skirts would allow for easier cleaning and would just look nicer. I had two options for the stair skirts. Install them first, then put on the stair treads and risers OR install the treads and risers first and then make the stair skirts placing them on top of the stairs. Placing the skirts on top of the treads would hold them on to the stairs more securely but then I had to be able to cut the skirts to fit around the bullnose molding on the stairs. I am not skilled enough to make these cuts nor do I own a router. So the skirts were made first and put in place. The skirts were made with 3/4" pine. I created the template for the skirts first with pieces of paper taped against the wall with the edge against the tread or riser until I finished both sides. I then traced the edge of the paper onto a large piece of cardboard I had from a large box and cut it out to resemble what the skirt would eventually look like in wood. I then took the large cardboard template back to the stairs to make sure it fit properly and did some tweaking. I then traced the cardboard template onto the wood and then cut it with the table saw. I saved the scrap triangles I ended up with, which came in handy for another project later. Sorry I don't have any photos of the different stages of making the stair skirts. Quarter round moulding was used on the top of the skirts to give it a nice rounded look. They were painted, nailed in place, caulked, and painted. For the piece of wood encasing the bottom three stairs, I bought some spray orange peel texture to match the texture on the drywall and painted it the same color as the wall. On the other side, I added the same beadboard wallpaper I used in the room on the lower level. I painted the stair treads with four clear coats of oil based polyurethane after cutting them to fit. No stain. This took about 2 weeks as I let the paint dry between coats. I waited another week before placing the treads on. The treads and risers were glued on with Liquid Nails starting with the bottom riser and tread. I did not not use nails on the treads but did use it on the risers using finishing nails hammered right through the tile and wood. The bullnose moulding on the tread hid the nails at the top of the riser. I know you are supposed to nail the treads also, but I did not want to mar the wood. I decided to take a wait and see approach. If the treads started to loosen I would then nail them. Almost two years later, the treads are still holding solid. I guess I used enough Liquid Nails. I still needed a stair handrail to replace the old wrought iron handrail that did not go as far as the last three stairs. Since I needed a custom length of 9', I went online to find one made out of red oak to match the treads. For the stair handrail, I went with a different online store, StairWarehouse. This company offers many different styles of rails in a variety of wood species. You order by the foot. I selected this style of handrail because I wanted to be able to grab the whole rail firmly with my smaller hands. I also ordered three wall brackets in an oil rubbed bronze finish. I only had three studs to work with which is why there are only three brackets. The handrail was painted with clear polyurethane and mounted on the wall. And yes, in case anyone is wondering, the handrail height is up to local building code requirements. The final piece I needed for the stairs was a piece of moulding along the top riser and main floor landing. The main floor landing now has laminate flooring on it. The moulding used on the end of the stair tread was not available locally nor was it available from the online store I bought the stair treads from. They did not sell the moulding separately. It was suggested that I buy another stair tread and cut off the moulding. Which just seemed silly to me when all I needed was the moulding. So again I went searching online for the moulding. It took a while but I found a company that had it in the exact dimensions I needed. Kinzel Wood Products, LLC had the moulding I was looking for in the wood species I needed. Like the handrail, you order by the foot. So I ordered 4 feet. I cut it to size and painted it with the clear polyurethane. I also had to cut a small piece of scrap laminate where it was missing. Both laminate and moulding were glued in place. The completed stairs are pictured on the right. Moulding was added to the wall corners on the left and the right. I placed a quarter round painted with clear polyurethane on the floor by the first riser. A decorative molding was placed on the front of the added stair piece. It took a few days for the dogs to get used to the stairs and yes, their toenails did eventually put scratches in them. But as far as I can tell, the scratches are in the polyurethane and not the wood. I also had an arthritic dog at the time who was having trouble with her hind legs on the smooth surface. Her legs would slip when she went up the stairs. So I decided to look for some non-slip carpet treads that I could use on the stairs to help her out and protect the finish from anymore claw scratches. 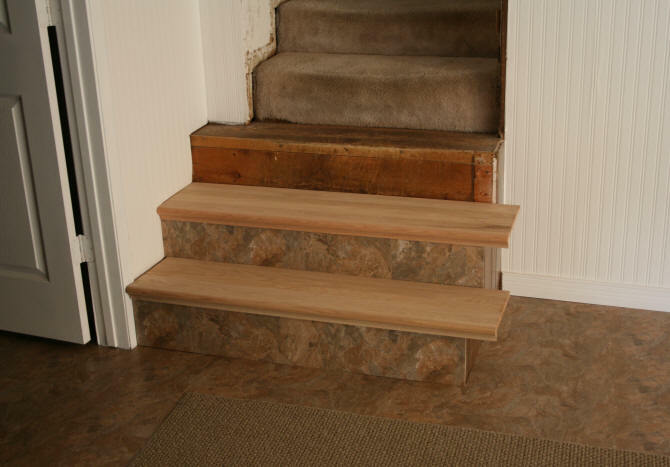 I found the perfect carpet stair treads from a company called Improvements. Not only are the treads non-skid, they are washable. I bought 2 sets of four. Do they work? You betcha! They stay put most of the time. The trick is to keep the surface free from dust underneath them. The area rugs they have, also stay put. Did it help my dog who was having difficulty with the steps? Yes it did. She now climbed the stair as easily (if not better) than when the carpeting was on the stairs. Cleaning the stairs is now a breeze and only takes about 10 minutes. I move the carpet, use a small whisk broom to get off the dirt. Wipe treads clean with a damp microfiber cloth, cleaning the stair skirts and dog slobber off the walls at the same time.